I started this book because I was going through a a book slump and I always seem to enjoy Little Red Riding Hood retellings. Almost immediately after beginning Crimson Bound I realized that this novel was a lot more than a retelling. Any relationship it had to Little Red Riding Hood was vague at best. Luckily, I still really enjoyed the story and Crimson Bound helped me get out of my reading slump! Crimson Bound has a plot that is hard to sum up. It begins when Rachelle is apprenticed to a Woodwitch and starts training to protect her village from the Forestborn/Woodspawn. When Rachelle is turned in to a Bloodbound, someone destined to become a Forestborn, she begins to serve the realm and is forced to guard the King’s son, Armand, who has become a kind of saint. A saint Rachelle does not believe in. Crimson Bound does a beautiful job blending mythology with an intricately woven story line. This novel has a lot of layers and I enjoyed how the story slowly revealed the nuances of the world that Hodge created. Rachelle was my favorite character in this novel. I liked that she had a past littered with decisions made in a moral grey area. Rachelle was a well rounded character and it also didn’t hurt that she was a totally badass fighter. My only issue with this novel was the romance. It was a love triangle that really had no place in the plot. I felt like everything in Crimson Bound was well thought out but for some reason the romance felt sloppy and unnecessary. I think I would have enjoyed this novel more had the romance been done away with. 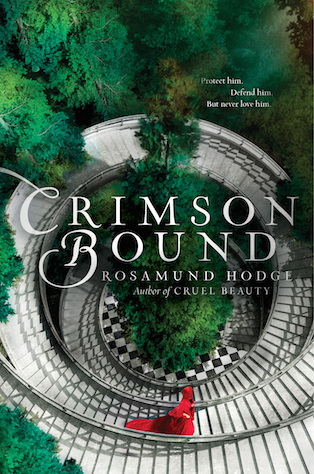 Overall, Crimson Bound was a beautifully written story filled with lush mythology. I only wish that there were more books set in this same world! I have no patience of unnecessary romantic triangles, sorry to hear that there's one here. Otherwise the book sounds fantastic. Thank you for sharing your thoughts! I thought this one was okay but a bit strange and at time I really didn't know what I thought of it. I wasn't keen on the romance much either. Rosamund Hodge has such a unique style of writing - I love her work! Crimson Bound was a wonderful read, although I did get a bit confused sometimes with the switching back and forth of the stories.